This seriously chocolatey cake means business! 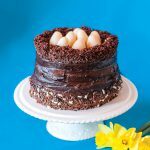 This rich vegan chocolate fudge cake is smothered in a silky chocolate ganache frosting and topped with a crunchy ‘nest’ filled with marzipan eggs for a decadent Easter dessert. This seriously chocolatey cake means business! 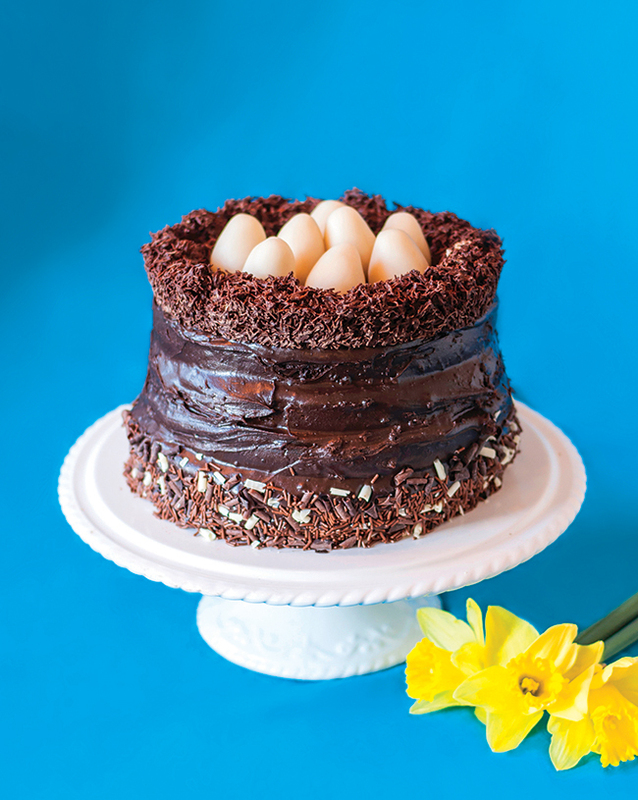 This rich vegan chocolate fudge cake is smothered in a silky chocolate ganache frosting and topped with a crunchy 'nest' filled with marzipan eggs for a decadent Easter dessert. Preheat the oven to 175°C/Gas Mark 4. Grease and line five 20cm (8in) round cake tins. Make a vegan buttermilk by adding cream of tartar to almond milk and leave to curdle while you get on with the next few steps. Blitz the ground almonds, flour, cocoa, bicarbonate of soda, baking powder, chilli powder and salt until fine, and transfer to a large bowl. Blitz the beetroot to a purée and add the sugar, melted coconut oil, vanilla and 'buttermilk'. Pour into the dry mix and, when combined, pour into the five lined and greased tins. Bake for 20 minutes. When poked, the skewer should come out clean. Leave to cool completely. Meanwhile, melt the chocolate over a bain-marie. In a large bowl, crumble the Shredded Wheat and mix in the melted chocolate. Grease one of your cake tins again and line with your chocolate nest mixture. Blitz all the frosting ingredients until completely incorporated and then spread between each cake layer, stack and then cover the outside of the cake. You should have enough to cover.